At the 2018 Farnborough International Airshow, Saab discussed the progress being made on Gripen E’s test aircraft, which is one of the contenders to become the next generation fighter for the Canadian Armed Forces. Saab’s head of business area Aeronautics, Jonas Hjelm, laid out how the next two Gripen E aircraft for the flight test program are benefiting from key design decisions. Two of the company’s test aircraft, known as 39-9 and 39-10, benefited by having new and upgraded computers rapidly added to them, explains Saab, further improving the capabilities from the first aircraft, 39-8. 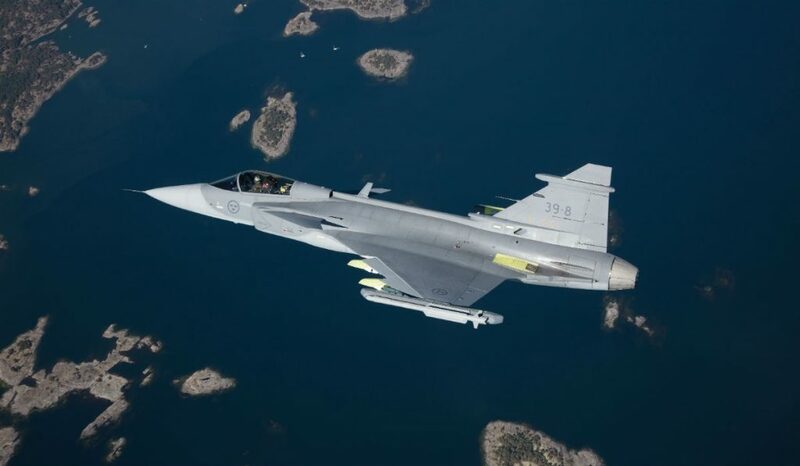 Saab continues to describe how a critical factor in adding the upgraded computing systems is that it could be done without affecting the flight critical systems. This meant the upgrade was completed in days and weeks, rather than in months and years as is typical in fighters. Saab reiterated how this means Gripen E can be at the forefront of air combat for decades as new features or technologies demand every greater processing power. Hjelm also revealed that in July, Gripen E began its first flight equipped with an IRIS-T air to air missile on each wingtip, and four pylons under the wings and the centre pylon on the fuselage. The flight included several test maneuvers at supersonic speed. This took place over the Baltic Sea and, according to Hjelm, paves the way for future trials involving carriage and release of missiles, drop tanks and other external stores. Saab then explained there has been progress with the design of the Gripen F, the two-seat version of the Gripen E. It is being designed with Embraer in Brazil and can be used for training, Combat Readiness training, Combat Missions and Electronic Warfare Officer, Mission Commander and Weapon System Officer in the rear seat. Additional highlights of the Gripen F, explains the company, have been further deliveries around key hardware like the Wide Area Display being led by the Brazilian company AEL Aeker. Gripen E is being developed for the Swedish Air Force and the Brazilian Air Force will receive both Gripen E and F aircraft.